A zebra chasing bubbles, a pony drumming, horses helping people heal, leaders listening from within, a herd running free – just another day at Pebble Ledge Ranch. 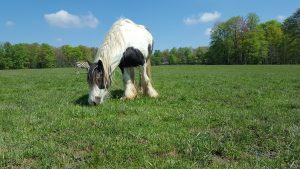 Meet Toby, grazing in the field. If you look closely, you’ll see Holly, the zebra, in the background of the photo above! The herd at Pebble Ledge Ranch shifts and changes with the cycle of the moment, the cycle of life, the cycle of nature. These horses are not kept to ride and live as naturally as possible at the Ranch, interacting with each other and humans – knowing their role in the community and living in the moment, together. Join Jackie Stevenson as she enters the complex self-organizing system of horse and herd. While Jackie lives and works every day at Pebble Ledge Ranch, visiting once or even having a conversation about it can make an impact. This place ripples as water does – literally impacting people’s lives in positive ways all around the globe. Jackie works with individuals and groups of all kinds to expand human identity into an ecological identity as respectful and trustworthy. People become members of her equine herd when they enter the horse field and in a bigger sense, members of the interwoven web of the natural world. Within this complex system one can learn to respond with resiliency, adapt to change and live fully in the present thereby discovering the gift of being human. 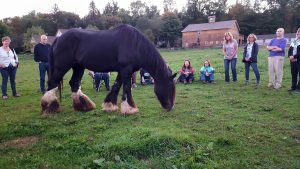 Jackie tells story upon story of authentic human and horse interactions – each steeped in complexity. These interactions are often life changing, eye-opening, big realization moments which most people experience once or twice in their lives. This experience literally has people step into the self-organizing system of the herd. In pausing from our everyday lives and through authentic presence (where one shows up honestly, often with vulnerability) and embodied listening (taking in information through ALL the senses) what often happens naturally is clarity. Horses are always attune to that which surrounds them. As a human (i.e. a human system, complete with biology, neurology, … ) enters into the system of the herd (literally walks into the fenced space), the horses are listening and sensing for danger and curious about how each human animal enters into the field. They sense if your body is full of tension and might wonder where the danger is. They sense if the human system is calm and grounded. Jackie tells about witnessing these experiences that she invites people to seek the experience of, “Opening to the unexpected and to every day miracles can shift our perspective of reality beyond what we expect and move to an emergent reality far beyond what we believe possible. I believe that all of us have the ability to turn the ordinary into the extraordinary when we live collaboratively with our own authentic presence and with reverence for the presence of all life. What happens in the field is something that’s felt deeply. However it goes way beyond feelings – often turns into individual action towards positive change. Theories and practices support the work. Whether it’s complexity theory, Gestalt principles, Theory U, design principles, biomimicry or you name it, there’s most likely already a conversation (or lesson) about it happening at the Ranch. Jackie (coach, therapist, educator and author) teaches at Case Western Reserve University Weatherhead School of Management Executive Education Program and the Mandel School of Applied Social Sciences. She is on the Weatherhead School of Management coaching staff and the ICF Gestalt Institute of Cleveland Coaching Program. She is a Board Certified Coach (BCC). She is the author of the book, “Someday We’ll Live Like Horses; Authentic Presence in Leadership and Life.” Jackie is the past Clinical Center Director of the Gestalt Institute of Cleveland. She is founder and director of the “Experiential Learning with Horses: Developing Human Potential for Positive Change” certificate program preparing people to integrate their work with horses into their professional work with people, and for people who want to develop their professional and life skills by engaging with horses.